One of the fundamental principles of Protestant biblical interpretation is that "Scripture is its own best interpreter." Luther expressed this principle with the words, Scriptura sui ipsius interpres ("Scripture is its own expositor"), and it was summed up by the authors of the Westminster Confession thus: "The infallible rule of interpretation of Scripture is the Scripture itself: and therefore, when there is a question about the true and full sense of any Scripture ... it must be searched and known by other places that speak more clearly." For this reason the most important feature of any edition of the Bible (aside from the quality of the translation itself) is the system of cross-references provided in the margin, which helps the reader to find out the meaning of any hard place by "comparing spiritual things with spiritual" (1 Cor 2:13). A good set of cross-references, when used diligently and with intelligence, will make much commentary unnecessary. One of the most useful study editions of the English Bible ever published, the Thompson Chain-Reference Bible, has nothing but subject headings and cross-references in the margin, with index numbers pointing to a topical concordance in the back of the volume. Many a student has found that with the patient use of this convenient system, the Bible is virtually self-interpreting. Other less elaborate "Reference" editions will serve the same purpose for students of the English Bible. The cross-references ordinarily published in editions of the New American Standard Bible are especially full and helpful, and another very good set of references is to be found in the "Classic Reference Bible" edition of the English Standard Version. But the best resource by far in this department is the Treasury of Scripture Knowledge, first published in the 1800's and available in many reprints. This volume provides over a half million cross-references, with most verses of the Bible having more than a dozen references each. Students who are able to use a Greek New Testament will find invaluable help in the cross-references given in the side margins of the Nestle-Aland editions (though not in the UBS editions which use the same text). Frederick Danker in the third edition of his book Multipurpose Tools for Bible Study (1970) gives ten pages (27-36) to showing how helpful these margins can be, and says, "These are virtually inexhaustible mines of information. The average student is unaware of their potentialities, and many a preacher has wearied himself in vain while the answer to the problems in his text lay a few centimeters to the right." Likewise, the lateral margins of the Expositor's Greek Testament give much help in the form of cross-references, quite aside from the exegetical commentary at the bottom of the page. Indeed we might say that the cross-references nearly always suffice to explain the text, without the commentary, because it really is true that "Scripture is its own expositor." Such cross-references will go far to explain nearly everything in the Bible chiefly because, as Ray Van Leeuwen puts it, "The language, imagery, narratives and poetry of Scripture are pervasively cross-referential." 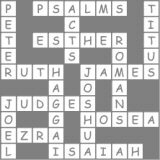 The verbal "cross-references" are there in the very language of Scripture, and these were apparent to diligent students long before anyone had the idea of dividing the text into numbered verses and filling the margins with references. Many times students have grasped the correct interpretation of a difficult expression by remembering a parallel usage somewhere else in Scripture, or have hit upon the right interpretation of a passage by comparing it with another passage. What we have now in the margins of our reference Bibles is the scholarly deposit of generations of such insights, laid out for our inspection -- if we will only take the time to look them up. The cross-referential nature of the Bible is most plainly seen by English readers who have become familiar with the words of an essentially literal translation, because the original "cross-references" are the verbal details which are reproduced in a literal translation. For this reason, the habitual use of a literal translation gives students the same "referential" capability which is given by cross-references. Below is an excerpt from Leland Ryken's book, The Word of God in English: Criteria for Excellence in Bible Translation (Wheaton, Illinois: Crossway, 2002), pp. 149-151, in which the cross-referential advantages of an essentially literal translation are explained more fully. Some principles of biblical interpretation belong to the realm of general hermeneutics -- principles that apply to the interpretation of any text, whether in the Bible or the Harvard Classics. Other principles apply specifically to the Bible and are known as special or particular hermeneutics. The subject of the unified network of cross-references and foreshadowings and echoes that we find in the Bible is perhaps the preeminent example of special hermeneutics. As an entry into this complex subject, I would ask you to picture the pages of a Bible with cross-references listed in the margin. I would note first that the Bible is the only book I know where this format regularly appears. Even after we have eliminated the somewhat arbitrary listing of passages that express similar ideas or simply use identical words, we are left with an anthology of diverse writings that are unified by an interlocking and unified system of theological ideas, images, and motifs. Together the diverse elements make up a single composite story and worldview known as salvation history. Biblical interpretation has legitimately been preoccupied with tracing the intricacies of this system of references. Of particular importance has been the use that New Testament writers make of the Old Testament. Often a New Testament writer will evoke an Old Testament passage in such a way as to show its fulfillment in the New Testament, though many different scenarios also exist. To cite a random example, the poet in Psalm 16 at one point expresses his trust in God's providence and goodness with the claim that 'you will not abandon my soul to Sheol, or let your holy one see corruption' (verse 10, ESV). In the book of Acts we find a sermon of Paul in which he quotes this verse and applies it to Christ (Acts 13:35-39). The relevence of this to Bible translation is that although biblical interpretation insists on the importance of the network of cross-references, some Bible translations and translation theories do a much better job of retaining the system of cross-references than other translations do. It is easy to see why dynamic equivalent translations have been nervous about the New Testament metaphors and technical theological vocabulary that are rooted in Old Testament religious rituals. The New Testament references are frequently odd and difficult. That modern readers will find such references easy to understand is out of the question. But to remove them from sight violates a leading tenet of biblical hermeneutics. Many of the New Testament references of which I speak pick up something from the Old Testament system of sacrifices and offerings and turn it to metaphoric use in discussing some aspect of the Christian faith. James 1:18 provides a typical example: 'Of his own will he brought us forth by the word of truth, that we should be a kind of firstfruits of his creation' (ESV). The mention of firstfruits is an evocative allusion to one of the three most important annual festivals in Old Testament religion. The firstfruits were the first portions of a crop. It is impossible to overemphasize how evocative the first portion of a crop is in an agrarian society. (From my childhood on a farm I can remember the thrill of seeing the radishes that appeared on the supper table every spring as the first produce of our garden.) In the Old Testament religious rituals, firstfruits were presented to God as part of the annual harvest festival known as the Feast of Weeks (also called Pentecost). 'He wanted us to be his own special people' (CEV). 'And we, out of all creation, became his choice possession' (NLT). '...showing us off as the crown of all his creatures' (The Message). '...so that we should have first place among all his creatures' (GNB). Special hermeneutics tells us to respect the interrelatedness of Old Testament and New Testament references. Some dynamic equivalent translations fail to show that respect. Contrariwise, essentially literal translations and some dynamic equivalent translations preserve the network of cross-references. These translations assume that Bible readers will find the inner and outer resources to ascertain the meaning of a reference to firstfruits. Translations that are unwilling to make that assumption and that aim for immediate comprehension by an uninitiated reader are compelled by their very theory to abandon a hermeneutical principle that is a central tenet of evangelical hermeneutics, thereby obscuring the meaning of the original. 1. Raymond C. Van Leeuwen, 'We Really Do Need Another Bible Translation,' Christianity Today, October 22, 2001, p. 34. 2. Raymond C. Van Leeuwen, 'On Bible Translation and Hermeneutics,' in After Pentecost: Language and Biblical Interpretation, ed. Craig Bartholomew et al (Grand Rapids: Zondervan, 2001), pp. 306-307.